Iwafune-oki Oil-Gas Field Development | Our Business | Mitsubishi Gas Chemical Company, Inc. 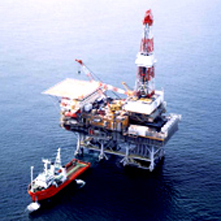 Discovered in 1983, the Iwafune-oki Oil-Gas Field is one of the largest Offshore Oil-Gas fields in Japan. It is located 30km northeast of Niigata City, 4km off the mouth of the Tainai River of Tainai City. Production and development of crude oil and natural gas in this Offshore Oil-Gas Field are underway by three companies: Japan Petroleum Exploration Co. Ltd., JAPEX Offshore Ltd., and our company. As a result of seismic survey carried out with air guns in the aforementioned region in 1982, it was determined that stratigraphic trap structures capable of storing oil and natural gas existed there. Furthermore, because geological conditions in the surrounding land and coastal areas were judged to have a high likelihood of producing oil and gas, four exploration wells were drilled in 1983-1984. All of these exploration wells succeeded in producing oil and gas, assuring that the Iwafune-oki Oil-Gas Field would be established. Based on these successes, the geological and structural analysis, reservoir evaluations, calculation of reserves, and feasibility studies carried out for the aforementioned structures from October 1984, it was judged that Offshore Oil-Gas Field development could begin on the Iwafune-oki structure, and it was decided development would be commenced in March 1989. This Offshore Oil-Gas Field has continued to be operated stably since it commenced production in 1990.